Dwelling Place summer get out the vote events allowed residents the freedom to drop by and paint a poster, register to vote, check their registration status and more. 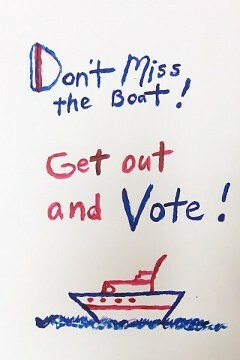 The deadline to register to vote is October 9th — for more information on the Michigan elections, visit Michigan.gov. 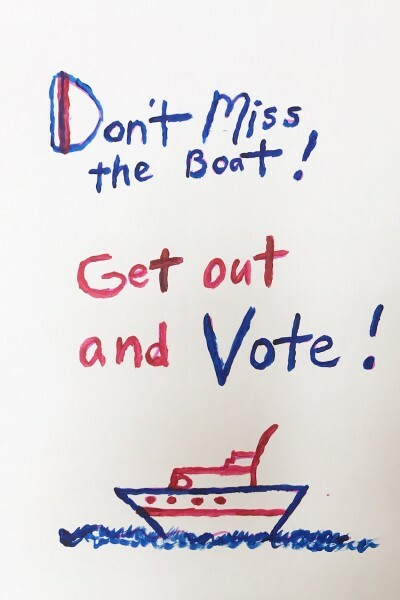 Throughout the summer, Dwelling Place interns from the Community Building and Engagement Department hosted ‘get out the vote’ poster-making at the Herkimer, Reflections, and Weston apartments. 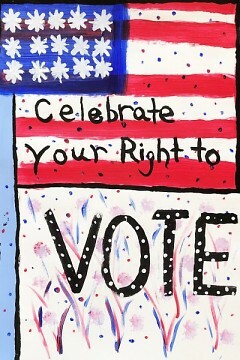 Each event allowed residents the freedom to drop by and paint a poster, register to vote, check their registration status and more. Within the ‘get out the vote framework,' residents were given the freedom to create any design they wanted. 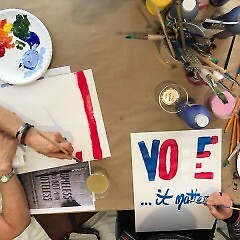 Voting materials mixed together with painting, conversation, and creative connections at these dynamic events. The artistic element allowed residents, staff, and interns to engage in informal political discussion in a friendly, judgement-free space. Oftentimes politics can seem irrelevant or intimidating to residents and community members. Encouraging folks to gather together around an artistic pursuit can open up barriers that traditionally exist in political or educational environments. Jason Van Wormer, a resident services coordinator for Dwelling Place, knows that when it comes to politics, “conversation is always going to be better than telling someone what to believe.” He has spent some time informing residents of ongoing political issues; conversations that have inspired further events and ideas for the Dwelling Place community. Dwelling Place has long sought to engage and inspire residents of Heartside and greater Grand Rapids with its programming. The community here is rich with a collaborative artistic spirit that has already created strong connections and a culture of cooperation. As Dwelling Place transitions into a new era of public collaboration, civic engagement and the artist leadership in the community will be at the forefront of their agenda. Events in the past such as ‘Voting Bingo’ have touched upon the civic engagement of residents in a creative and informative way. Using art as a vehicle for discussion of civic issues can help the process along, especially during election years that lack the momentum of a presidential race. Dwelling Place is joining cities and nonprofits across the country that are finding unique ways to utilize art in the service of civic engagement. In Minnesota, for example, Minneapolis’ Pillsbury House + Theatre is a multicultural company of artists that has partnered with Pillsbury United Communities to form an expansive social service and arts organization. Their programming combines the capabilities of an acclaimed professional theatre with a community nonprofit to create affordable, accessible programs and services for everyone from toddlers and seniors to homeless youth and young artists. Similarly to Dwelling Place, Pillsbury’s voter engagement is just one part of a larger effort to empower community members to partake in the civic process. The posters that Dwelling Place staff and residents created this summer will be used throughout the many properties to encourage and remind everyone to vote in the upcoming elections and select locations will host voting bingo. Join Dwelling Place residents in voting in the Michigan general election held on Tuesday, November 6, 2018. With a mission to improve the lives of people by creating quality affordable housing, providing essential support services and serving as a catalyst for neighborhood revitalization, Dwelling Place serves families and people in 4 counties across West Michigan. Dwelling Place is powered by volunteers and numerous staff persons, guest writers create our Rapidian content. Special thanks to Elsje, (Actor, and summer Dwelling Place intern) for coverage of Dwelling Place's Voting Initiative.